Abstract: When we first started acugraphing about two years ago, one phenomenon which we observed was that some of those who came appeared real sick but their acugraphs exhibited “good results”. 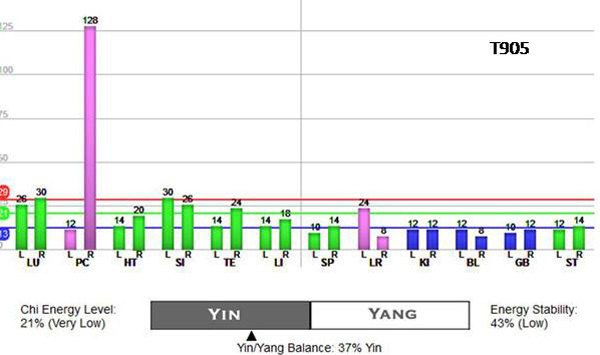 As Kimberly said, “Seeing a lot of green on a graph can be deceiving.” In this article we share with you our experiences with patients whose acugraphs showed such a phenomenon. They generally had a qi level of less than 20 percent. Declaration of Interest: CA Care records its sincere thanks to Dr. Adrian Larsen, President of Miridia Technology Inc., USA, for his generosity in donating a unit of AcuGraph 4 for our research at CA Care. We receive no financial incentive whatsoever from Miridia Technology for writing this article. Consultation, undergoing the e-Therapy and acugraphing at CA Care are provided to cancer patients free of charge. One question that comes to mind, What is the threshold value of qi required to make an acugraph reading reflective of the well being of a patient? Without knowing and understanding the mathematics underlying the calculations, it is not for us to speculate what would be an acceptable threshold value. Let us show you our results and you can make up your mind what that threshold value is. 1. H-360 was a 79-yer-old female with brain cancer. She underwent 47 sessions of radiation treatment. After receiving the second radiation treatment she was unable to walk. 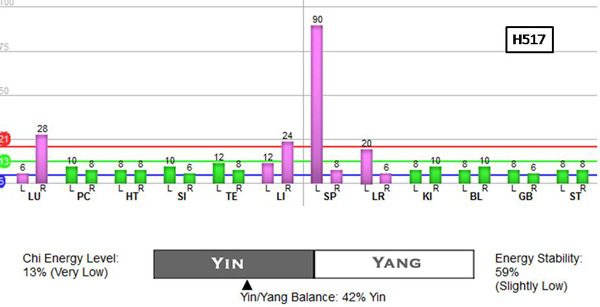 Her qi energy was only 12%. 2. H-517 was a 77-year-old male. He had diabetes, hypertension and hyperlipidemia. Later he was diagnosed with colon cancer that had spread to his liver. He underwent an operation. His qi was 13%. 3. M-1000 was a 69-year-old male. He had prostate cancer which had metastatised to his bones. He underwent surgery followed by hormonal therapy. His qi was at 13%. 4. H-587 was a 50-year-old female with kidney cancer that had spread to her lungs. She came with swollen legs and abdomen. Her qi level was at 14%. 5. H-362 was a 73-year-old female with lung cancer. She had undergone 6 cycles of chemotherapy but the treatment was not effective. She was asked to undergo radiotherapy. She declined. She had 14% qi. 6. S-62 is a 54-year-old male. He had tumours in both his left and right kidneys. He declined surgery. Although he looked fairly healthy, his qi was only 14%. 7. H-276 was a 57-year-old male. He had pancreatic cancer and had undergone an operation. Barely four months later, the cancer recurred and spread to his liver. His qi was 15%. 8. H-591 was a 62-year old male. He was diagnosed with liver cancer. No medical treatment was indication. His abdomen was bloated and his legs were swollen. He had severe jaundice. His qi was only 16%. 9. H-358 was a 76-year-old female with stomach cancer. Her CEA was at 9,113 and CA 19.9 was at 2,476. She was given 2 to 3 months to live. Her qi was 16%. 10. S-49 is a 53-year-old male. He had brain cancer. He refused medical treatment. His qi was 16%. 11. H-540 was a 73-year-old male. He had colon cancer and underwent an operation. About two years later the cancer spread to his brain. He underwent a cyberknife surgery. The cancer spread to his lungs. He had radiotherapy and a repeat of brain surgery. His qi was 17%. 12. H-305 was a 77-year-old male. He had diabetes for more than 20 years. In addition he had hypertension and heart problem. Then he was diagnosed with prostate cancer. He suffered from kidney failure and needed dialysis three times a week. His qi was 18%. 13. H-556 was a 87-year-old male. He had colon cancer with liver metastasis. No medical treatment was indicated due to his old age. His qi was 19%. 14. M-971 is a 61-year-old female. She had lung cancer with brain metastasis. She underwent 40 cycles of chemotherapy. In addition, she took Iressa for a year, Tarceva for 2 years and Sutent for a month. She was medically given up and came to CA Care for help. She took herbs and regained her health. This acugraph was taken after her recovery. Her qi was 19% with a “perfect score”! 15. H-330 is 41-year-old male. He was diagnosed with lung cancer. The cancer had probably spread to his liver and bone. His qi was 20%. 16. H-355 is 75-year-old male. He had lung cancer with metastasis to his liver and bone. He received many cycles of chemotherapy. His qi was 21%. 17. T-905 is a 61-year-old male. He was diagnosed with lung cancer. Both his legs and hands were swollen. He refused medical treatment. His qi was 21%. 18. H-442 was a 55-year-old male. He was diagnosed with metastatic undifferentiated carcinoma. Both of his legs were swollen. His liver and some lymph nodes were affected by the cancer. His qi was 22%. 19. S-01 is a 43-year-old male with cancer of the caecum. He was asked to undergo an operation. He declined. His qi was 23%. 20. M-974 is a 59-year-old female. She was diagnosed with chronic lymphocytic leukemia. She had gone to Holland, Mayo Clinic and M.D. Anderson in the US, and Singapore for consultation before coming to CA Care. 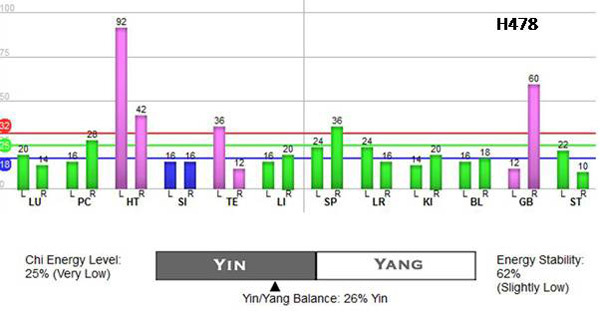 Her qi was 23%. 21. H-114, a 54-year-old female, was diagnosed with pancreatic cancer. She underwent surgery but refused chemotherapy. Her qi was 24%. 22. H-469 was a 54-year-old female. She was diagnosed with pancreatic cancer with metastasis to her liver. She refused medical treatment. Her qi was 24%. 23. H-478 was a 75-year-old male. He was diagnosed with stomach cancer. He underwent an operation but refused chemotherapy. His qi was 25%. 24. H-128 was a 67-year-old male. He had liver cirrhosis which later developed into multicentric hepatoma (liver cancer). He declined medical treatment. His qi was 25%. Patients who showed this “flat out green” phenomenon generally had qi level of less than 20 percent. A more “reflective picture” is obtained with patients having qi level of 20 percent or more.